By Brian Voo in Desktop. Updated on August 5, 2016 . If you have to work with many opened folders, your desktop can get a little messy. Finding the folder you want from one open window to the next will be a nightmare. It’s no surprise that some of us prefer the tab setup like how it is on the Chrome browser. It’s easier to navigate through, locating, opening and closing tabs as required. Actually, you can have that feature with a little help from Clover. It helps you work faster by integrating the tab feature into Windows Explorer so you can manage your folders like how you manage your browser tabs. Firstly, download Clover by clicking on this download link and installing it. The first thing you will notice is the clover leaf icon on the taskbar. All your folders from now on will be handled by Clover. 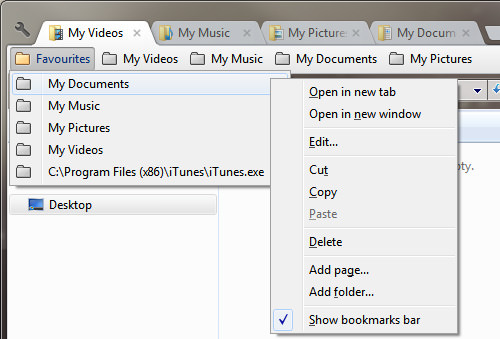 Every new folder you open will open in a new tab similar to browser tabs on Google Chrome. Opening a new tab will bring you to My Computer as the default page. Clover also gives you a bookmark bar on which you can organize and execute .exe files from the bookmark bar. You can also group programs in folders and navigate program shortcuts with ease. As an example, we’ve created this ‘Favourites’ folder below. You can store the locations of folders such as ‘My Documents’ and ‘My Pictures’ and even launch programs with it – launch the last link you see in the shot below to run iTunes. Ctrl + D Bookmark current folder. These are shortcut keys that most users know intuitively. Here are a few more tips to help you become an ultimate Clover user. Double clicking on a tab closes the tab. Middle clicking (mousewheel click) on tab closes the tab. Holding Ctrl while double clicking on a folder opens that folder in a new tab. Right Click on a folder and pressing E opens the folder in a new tab. Middle clicking (mousewheel click) on a bookmark opens the location to a new tab. Dragging folders to the bookmark bar bookmarks the folder. Dragging folders to the tab bar opens it in new tab. Dragging folders onto an existing tab replaces that tab with the dragged folder. Dragging a tab outside of the current window opens it to a new window. Clover is a powerful and simple add-on to better your Windows navigation and organisation. It is also very lightweight and does not take up a lot of RAM when handling many tabs. We expect many more features to come with future updates such as custom folder icons on the bookmark bar. You can follow them through this Google translated website, but even with its current features, Clover is a worthy download.